One of our newest comms recruits, Dani, talks about her first impressions of UKFast and how we do things differently here! I’ve had an odd few weeks, with lots of change, soul searching and moments of endorphin fuelled reflection resulting in a new and exciting opportunity with the UKFast family. At the beginning of February I joined an app start-up and hurled myself head first into my new role as Leader of Voice and Content. So, when our funding was pulled and the whirlwind adventure came to a close it was a smidge of a shock to the system. Fortunately, after only three days of being back on the job market, I had my first chat with UKFast. I asked my old mate Al in the Comms team (the team I was hoping to join) what his UKFast experience had been like so far. His response set my expectations for my impending visit high! It didn’t take long to realise he was completely right and the atmosphere these likeminded people were effortlessly generating was right up my street. They had created an environment buzzing with energy and an enthusiasm for what they do – all with a good old fashioned friendly greeting at the door. This is something UKFast and my previous place of employment share, but the tipping point for me was the overwhelming commitment throughout the business to being healthy and finding a work-life balance. After several years of working in Manchester’s thriving digital industry, I’m fully aware of the nature of the beast and the tendency of those in its belly to hop from one job to another in order to propel themselves up the career ladder. Yet within a few short hours at UKFast it was evident that this way of thinking slips away entirely once you become a member of its growing team, with those who have been here for a year still considering themselves to be relative newcomers. While lots of companies welcome their employees in with open arms, some lovely stationery, the allure of fresh fruit and all the tea and coffee you can guzzle, nowhere I’ve ever been – or heard of – inducts newbies quite like UKFast. They invest in people with time and energy from the moment they walk through the door – and it doesn’t stop there. My first week was spent getting a crash (but very thorough) course at UKFast University, with the riotous duo Sax and Arlene. Everyone in the induction class was exposed to the make-up of the business regardless of the team they joined. The UKFast building is great too. My induction buddy Hester has used the word dynamic (one of the UKFast core values) to describe it on more than 10 occasions already, and she’s bang on. It’s a building that reflects the people within it. The décor is bright, vibrant and chock full of natural light pouring in from the endless windows, so that even on a slightly overcast day (which is obviously a rarity in Manchester) each room still feels full of life. Where there’s an opportunity to build something unique, they’ve done it. There’s a gym, a bar, a Zen garden and several chill out areas. And this summary barely scratches the surface! Sound enticing to you yet? 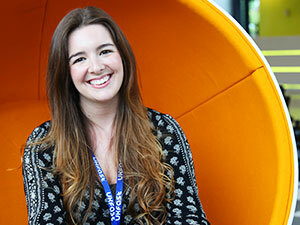 Take a look at our careers page to see if you could be the next UKFast superstar.